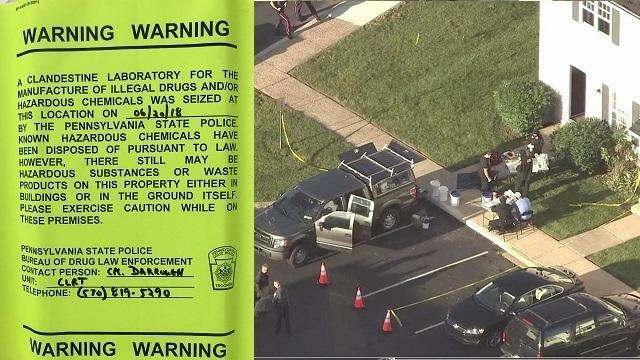 Authorities raided an apartment in Montgomery County, Philadelphia on Wednesday morning and seized evidence of a meth lab. Four individuals have been arrested and are now in custody. Officials responded to the scene at Rolling Hills Apartments around 3 a.m., closing off Buchert Road in Sanatoga to investigate a tip they have received regarding the presence of a meth lab. Once inside the apartment, police say they discovered components of an illegal drug lab manufacturing methamphetamine. Chopper 3 flew over the scene of the investigation where officials were documenting items taken from the house. Four people from the apartment were detained by the police. Criminal charges are pending while the authorities complete the investigation. A neighbor, Tim Lesane, says they learned quickly about the police operation in the area, and naturally they got concerned since police presence is not normal in their neighborhood. He says theirs is usually a “nice place” and that they don’t have such illegal activities going around. The operation was made possible by the joint efforts of Lower Pottsgrove Police Pennsylvania State Police Clandestine Lab unit, the Montgomery County Detectives, Upper Pottsgrove Township Police, Limerick Township Police and Royersford Borough Police Department.